Yeah I really don't see why it would take so long to put up. I bet they won't even start construction for this ride until january. It really is pathetic marketing it as a coaster. They just want to do that since it is in rolling thunder's spot, so people can't complain, "why didn't you replace rt with a coaster?" They can say that they did, though we all know they really didn't and it is just a stupid carnival ride. I already said it. I can deal with the Looping Dragon (though I think the name stinks and it really isn't a coaster)...but dang it, I want Namtab! Six Flags Great Adventure, the world’s largest theme park (Only because of the Safari area being counted towards total space of the park, Great Adventure is not the largest in terms of ride count, coaster count, or attraction count- simply occupies the largest amount of land, again, only because of the Safari ride) , plans for more roller coaster thrills (Not a roller coaster) and Halloween scares in 2015. The 510-acre theme park, which was recently voted America’s second best theme park by USA TODAY readers, debuts the park’s thirteenth roller coaster (Not a roller coaster, so it's still 12)— Looping Dragon, (LOL) and expands its notoriously scary Fright Fest Halloween festival. 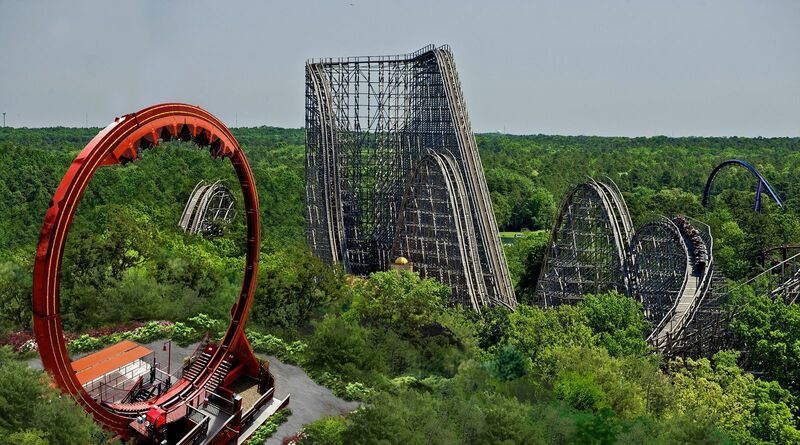 In 2015, Six Flags Great Adventure introduces its thirteenth roller coaster,(Not a roller coaster) Looping Dragon. Twenty riders sitting in “face-off” seats rocket (At what speed can we say something "Rockets"? The only time the ride reaches a somewhat 'high' speed is when it is finishing the cycle and completing full loops) forward and backward pendulum style until the train gains enough momentum to complete a full revolution seven stories in the air. The coaster (Flat-carnival ring of fire super loop, not coaster) then kicks into high gear, (getting crazy now...) completing full revolutions until it stops momentarily with riders suspended upside down, and then reverses direction for even more thrills. Who makes these decisions for all the parks? I would've been happier with a basic flat ride and the fact they keep pushing coaster is ridiculous. The gp seems to either be falling for it (based on comments from the Instagram page) with comments like 'cool!' 'Awesome' 'can't wait' etc etc, or there are comments of 'this is a carnival ride', 'I rode this at my carnival' 'dumb' etc. If the rendering is right, seems to be going where RT's station was and don't get how that is considered golden kingdom. To me it looks like the exit will be where rolling thunder's entrance was, and the actual entrance to the ride will be over in the golden kingdom. I am absolutely surprised by the announcement, we'll just have to wait and see. Something tells me that we are getting a big coaster in 2016, you have to look at the big picture. This should not take long to put up though. It's good to see some new sources aren't calling this ride a roller coaster though. I also wonder if the movietown walk through will utilize the old Chiller station as the "Maximum security prison"
Its only been since 2006 that SFGadv has added a good ride. On the positive side, its good to see they are going to be open until November 1st next year and not have closing day on October 25th. So...for all of you...what is the issue? Is it the fact that we aren't getting a super thrill ride or a huge new coaster? Or is it something else? But what really gets me a bit annoyed-even if the manufacturers of the ride call it a coaster...it is by far NOT a roller coaster and shouldn't be marketed as such. What's up with NAMTAB? I could care less about this thing. Bad placement, imo, Toro and Ka are going to completely dwarf this thing. I don't understand why the ride isn't going to open until late spring. These rides should only take a few days to set up and test. Waiting for Zumanjaro to open was frustrating, and I hoped that the park would have learned from that and planned to have it ready for opening day. My guess is that they want people who visit in the first couple months of the season to return and maybe buy a season pass rather than just go to the park once in the beginning of the season for their only trip of the year. I showed my mom the pic of Looping Dragon and asked her if she thought it was a coaster and she said no. She's by no means an enthusiast and she still figured out it's not a coaster, a fair amount of the general public will probably be able to figure it out too. For what it is the ride is decent but calling it a coaster is worse than TDK's horrible marketing. The late new ride openings I've just come to expect from the park even though it's ridiculous not to have rides like this open for opening day. Interests:love rollercoaster. bizarro at sfga is the best. Well I haven't be on a "ring of fire" type ride since the last time I went to a carnival when I was like 12 so Im gonna be happy to get back on one. I told some of my friends what we were adding and they seemed excited soooo... there are some people who will appreciate this type of ride. HOWEVER... this is not a roller coaster. Yes its a car on a track... but its not a roller coaster. Close but not prize. And the name Looping Dragon just doesn't roll of my tongue. I'll call it the Dragon.. or Fireball Dragon, but Looping Dragon?? Why is the name of our Super Loop so much lamer than the other parks? (Dare Devil Chaos Coaster, Bourbon Street Fireball, Joker's Chaos Coaster.) Now if they add a legit Dragon to the top of the ride that breathes fire when u go upside down THEN ill be impressed.. but the name isn't doing it for me. And then there is the location. It seems the left side is just always getting all the attention. I can see why they would want to add something over there since now we have all that empty space in between Zu and Toro, but I kind of wish Movietown got some love. I like how SF Over Georgia is adding two new rides themed to the Joker and Harley Quinn. That would have been PERFECT for Movietown turned Gotham City. Plus NAMTAB, that would've brought life to the area. Such a missed opportunity right there. And from the concept.. if they use Rolling Thunder's old station then technically wouldn't it be part of Plaza del Carnaval? In that case I would've named the ride the Tequila Turnaround.. where they give u a free shot of tequila and a lime before u get on. NOW THAT WOULD BE A RIDE WORTH WAITING FOR!!! I think the reason it's taking so long to open is due to the queue, scenery, and path rerouting tbh, not the ride itself. While I'm bummed out by the announcement of this ride, I'm more upset that Namtab won't be coming to GADV. ^exactly. Talk about false advertising. So... Rhymes with banana... Is was cabana wasn't it? So...then what did the backwards 1993 stand for? Okay, I HAVE to reply to this topic. First of all, I am so disappointed in Great Adventure! All these years it's been the same rides over and over again, plus, I had a bad last trip because I lost my season pass on El Toro, which I think is getting more bumpy, but is still very fun. Everyone was thinking that the park would get a new real coaster, and here's this thingy. Well, watch everyone flood into the golden kingdom and no big thrill seeker gets on this thing. The Golden Kingdom is the best part of the park, and they have to ruin it with a terrible small ride that they claim is thrilling and a "coaster". My birthday is always around announcing new rides time and I figured that it really should be the year for a good coaster, but as the time neared; I was so disappointed and this will totally ruin my birthday and scar my hard love for the park. Every time I go to SFGA, there are only three to four rides that I ride--Kingda Ka and El Toro and Zumanjaro and sometimes Nitro. If they don't get a new good (preferably Intamin) coaster next year, I will be seriously miserable. You’ll face off against other riders in specially designed seats (They're not specially designed, pretty sure they will be the standard issue seats that come from the manufacturer) which bolt up and back the looped track like a pendulum, higher and higher until you’re suspended completely upside down in mid-air! Then the Looping Dragon gains enough momentum to soar through a full 360 degree loop, again and again and again! The steel beast can (Steel Beast... LOL) even change directions, halfway through the loop!